The teenage life is one of the most exciting and interesting stage of an individual's life. The newfound independence enable one to explore opportunities to learn, enjoy and experience life. It is also the time when your growth hormones go bersek. My nephew, Ian, suffers from acne. Flare ups causes redness and sometime swelling on his fair skin. Outdoor activities makes his acne ever worse. And because of this, he often shys away from people. He lost confidence because of how he looked. I introduced him to Proactiv Acne Solution and he was amazed that Proactiv works a good deal better than the other brands in the market. It eased out swelling acne and took out swelling in less than a week. Now he is back doings things that offer opportunities for social, physical and cognitive development. With a smooth, clearer skin, Ian is ready to take on the world with determination and good self-image. 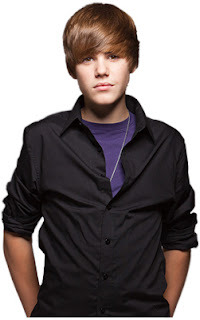 Similarly, Justin Bieber has only good words for Proactiv. He doesn’t have acne, but he endorses Proactiv because he believes that . Proactiv is the way to go. An ounce of prevention is worth a pound of cure. ''It just makes you feel so much better about yourself," he says. See more Celebrity testimonials from satisfied Proactive users. Proactiv® Solution, the #1 anti-acne system in America offers a Combination Therapy™ system that prevents pimples from coming back. 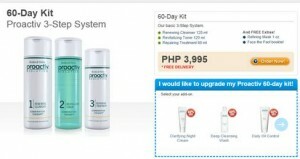 Buy Proactiv® Solution 3-step now and be eligible for money-back guarantee. 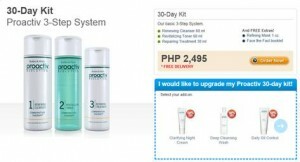 You may purchases of Proactiv Solution 30-day kit or Proactiv Solution 60-day kit by logging on to the Proactiv Online Shopping cart and have the chance to avail of the Upgrade Promo exclusive to Philippine residents. 2. Registerand create and account to enable you to do transactions and purchases. 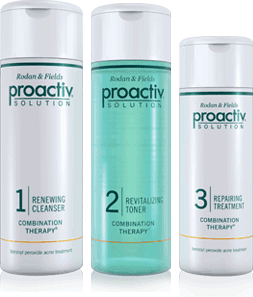 A purchase of the Proactiv Solution 60-day kit entitles you to upgrade your kit with 1 Proactive extension item at 60% off. You can have it all, simply because you have Proactive. It is the one protection you need to keep those menacing pimples away. A healthy skin will make you look and feel good. I thought of using Proactiv when I had really bad pimple problems but since it's really pricey, I didn't push thru with it anymore. Hehe. Good thing my pimples left me when I stopped worrying about them. have you tried proactive? I am.kinda reluctant with this product as asian and american skin are different. most of their endorsers are caucasian and yeah its pricey for Pinoys to afford. Yes, I have. It's a bit expensive but the rewards far outweigh my investment. It works well on my super sensitive skin. thank you. I'm sure your sister will benefit from using Proactiv. This is perfect for my sensitive oily skin. I might try it.